Rolling hills, umbrella pines, fields of sunflowers, Olive groves, vineyards and medieval towns perched on hilltops -these are the ingredients that make up both Tuscany and Umbria. We live just in Umbria and would like to introduce you to just a few of the wonderful places that make it so magical for us. Whether you are religious or not it would be impossible not to be moved by this wonderful Town. 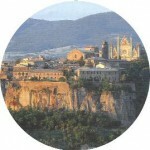 Visible from miles around, perched on a hillside, it was home to and is the burial place of St Francis. You can retrace his steps, see the simple Church that he restored, now enveloped in a huge ornate memorial to his life; or just wander round the streets soaking up the atmosphere. 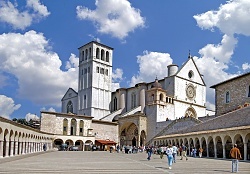 Assisi was badly damaged in an earthquake in 2000 but has now virtually been restored. Also in Assisi is the burial place of St Clare who founded an order of nuns who spend their lives in silent contemplation and prayer. 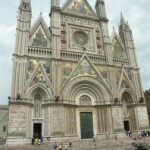 The Cathederals commorating the two saints sit at either end of the spine of Assisi and make fascinating visiting. Gubbio is spread out along the foothills of Mt. Ingino. Famous in Italy for having the largest Christmas tree in the world – Gubbio has much more than this to offer the visitor. Interesting streets wind ever upward and for the brave there is a funicular to take you to the top of the town. At Christmas time the streets are alive with Christmas lights and although it is often bitterly cold in Winter it is a great place to visit. The biggest Christmas Tree in the world – Christmas season. One of my favourite places, Orvieto is perched on a rocky peninsula visible from miles around. During the medieval wars it was never over run and it withstood the many sieges because it had a huge well and a series of caves where food could be squirreled away or flown in, literally -roosting pigeons provided a ready source of food. 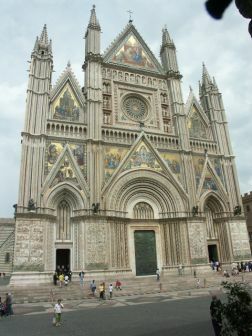 Home to a delicious crisp white wine -Orvieto Classico – The Town also has a wonderful Duomo with an amazing facade. 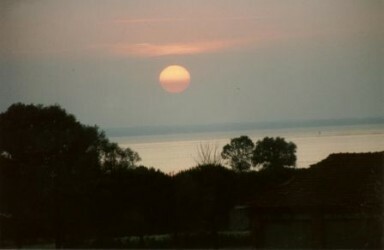 Nearby is Lago Corbara, a reservoir lake set in stunning scenery and beyond that the attractive medieval Town of Todi. 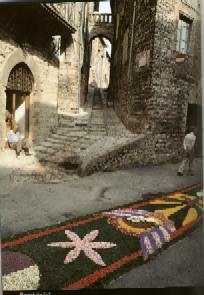 Small and perfectly formed, Spello is a beautiful ‘Townette’ which every June carpets its narrow steeply winding streets with wonderful flower pictures to celebrate the feast of Corpus Domini. Bevagna is one of the few Towns that lies on the flat. It has pretty Roman baths and at Corpus Domini the Town turns into a medieval market, recreating the trades of yesteryear with faithful recreations of pottery, breadmaking and metalwork. Locals don medieval costume and go about their business as if they were back in medieval times. is a bustling town with Ferries plying back & forth to Isola Maggiore. Restaurants and hotels nestle by the Lake and there are small shops selling wonderful pottery. is still at heart a fishing village with little boats trawling the lake and bringing back the fish. There are several wonderful fish restaurants and some of the best pizzas around. There is also a fishing museum and ferries that travel back & forth to Isola Polvese. lies high overlooking the Lake. It is a magical village that has a wonderful square with lively cafés and restaurants. 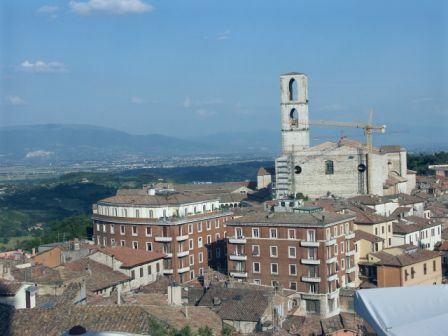 The Square resounds to live music during the summer and there is a lace museum which hosts many Art exhibitions,and a famous Perugino painting in one of its Churches. (lion Castle) is the nearest Town to us and is winner of the slow city award which is given for quality of life, facilities and service. The old town is traffic free and beautiful with gastronomic shops, delightful restaurants and a lively atmosphere. It hosts many events from the Tulip Festival in April to Gospel singing in the Square on New Year’s Eve. Ferries travel to and from Isola Maggiore which is the main inhabited Island. There are two sandy beaches, a sailing club and some delightful waterside Pizzerias, bars and restaurants. There is also a lively market every Wednesday morning.